Well this is cool. 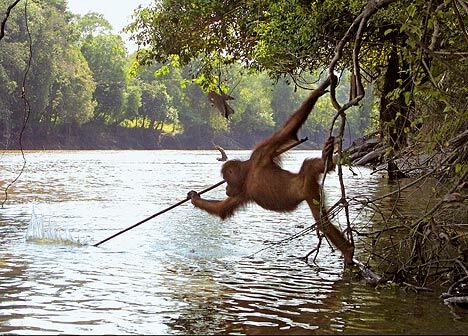 An orangutan has been caught on film spear fishing. This sort of tool use is, apparently, entirely unpresendented in orangutans. That’s pretty awesome. Human beings are far from the only tool-using species on the planet, but this, for some reason, strikes me as a very particular sort of tool use. This is the kind of tool use that is intended to solve a very general and pressing problem: “I’m hungry and want to catch something to eat. How do I do that?” And the solution seems, to me, to be a delightfully “human” one: a handy perch and nice, sharp stick. Wait, wait. Are there any non-gratuitous Planet of the Apes references?